Teachers are supposed to inspire the younger generation to follow their dreams and achieve great things. However, our hero, Nozomu is not that teacher. Nozomu's probably the most depressive man in Japan--so depressive, in fact, that every little setback in life inspires yet another suicide attempt! But then why is being in Nozomu's class such a blast? Is it his quirky and endearing students? The bizarre adventures he leads them on? Or is there something after all to "the Power of Negative Thinking"? 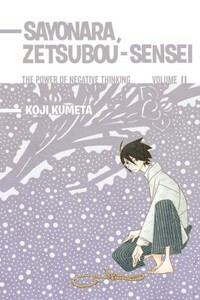 SPRINGING INTO A SUMMER OF SELF-DISCOVERY It's spring in volume 11, and Zetsubou-sensei and the students master the art of detuning; that is, purposefully inhibiting he performance of something. Then, during summer vacation, they go on journeys of self-discovery, confront a mob of zealous over-preotectors, and dodge spy accusations ont he beach. Finally, back in the classroom, they are caught off-guard by surprise inspections masterminded by Zetsubou-sensei and Chiri Kitsu! Includes special extras after the story!